Here is our next TOS Crew review! I personally was interested in King Alfred's English. Especially the part about the Bible being translated. I still am not sure if I will use this for my children or not, but it is a very interesting read for those who wish to know more about where our English came from and why we use some of the words we use. I personally love English. History is not really my favorite subject, but my daughter LOVEs it. I am a teacher, writer, speaker and former homeschooling mom of 3 grown kids. My husband and I live in a log house in the middle of the woods outside of Atlanta, GA. The books, the timeline, and other materials on this site are being used by homeschool and Christian school students as well as adult Bible classes. My hope is that these materials and articles will help you and your children to consider history, language, and grammar in new ways–with fewer dry facts to memorize and more of the huge story God has told–and to appreciate just how intriguing the lives lived before us really are. 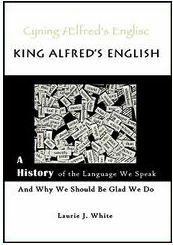 The book, King Alfred's English is a history of the language we speak. Reading the book will give you and your children quite a bit of history like, "Do you know why England has two names?" It also covers much about the battles that went on to control England, and because of this the changes we see in the language. Overall it is an informative book. There is one thing though that I did not care for, and that was some of the words used in the book. To some I may seem too hard, but I try to keep certain words out of my children's vocabulary. Even the older ones. You can find more information on King Alfred's English on Laurie's website, The Shorter Word. The book is recommended for ages 12 to adult. You can purchase this book online, the lowest price presently being on CBD for $14.89. It is available for Kindle for $5,95. The English were NOT the British. In fact, they fought each other…a lot. And still today, if you call an English person British, he might very well correct you even though he knows you probably won’t understand. You probably don’t pronounce the word “when” like your parents. When you say “when” and “win,” do these words sound the same? If you’re under 50, they probably do. If you’re older, you may still pronounce the sound of the “h” and the words sound slightly different. I still pronounce the “h,” do you? Be sure to check out what other Crew members are saying about King Alfred's English by clicking on the banner below. I am not a big fan of history myself, but I love to read so I do think this would make an interesting read. This looks like an interesting read. Thanks for the review.